Does however pose the questions about in how far that actually helps the students develop their own understanding of and position to design or in how far they simply become a cost-effective tool for the manufacture; and how many of the projects ever actually make it into production. That Marie & Nanna’s cooperation partner, Le Klint, took on the Arc Collection, and that largely unchanged from the prototypes as exhibited in Kolding, answers both questions, in terms of this particular project, in the positive. Consequently this post isn’t so much about us blowing our own trumpet, but much more is about us fulfilling our promise to keep you informed about the fate of the innumerate projects, prototypes and works in progress we encounter day to day. And that student projects can become real products. 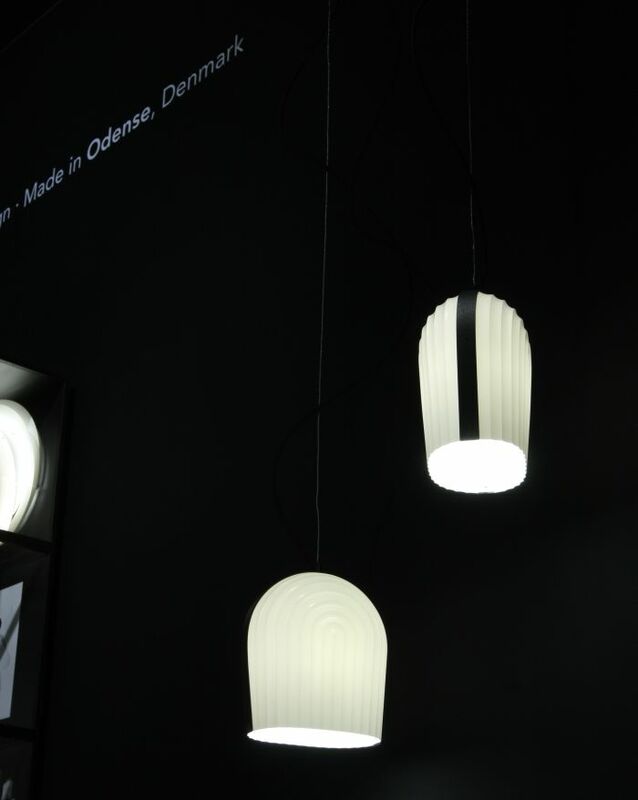 As previously noted Le Klint was established, more or less, as a platform for the pleated lampshade originally designed by the Danish architect Peder Vilhelm Jensen-Klint, further developed by his son Tage Klint, and which today remains not only one of the company’s best sellers, but a (much imitated) classic of lampshade design. For their Arc Collection Marie & Nanna were inspired by the arches of Peder Vilhelm Jensen-Klint’s Grundtvigskirken, Grundtvig’s Church, Copenhagen, a truly monstrous expressionistic work. The result is a very contemporary family of lamps in which the flow of the arches are expressed in lightly abstracted forms, and that in objects which are much more reserved, modest, if every bit as self-confident, as the Grundtvigskirken. 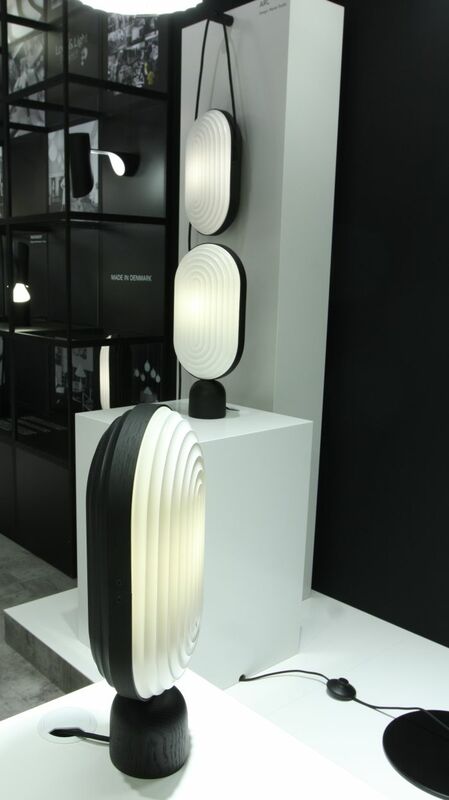 As we were taking our photos at IMM Cologne we overheard someone behind us describe them as being “a bit too Art Deco”. Sadly by the time we turned round they were gone and so we had no opportunity to add our tuppence that while, yes, they do have a very dangerous hang to Art Deco, the arches on which they are based were sketched by a reformist architect in the first decades of the 20th century. So yes, they are a bit Art Deco. 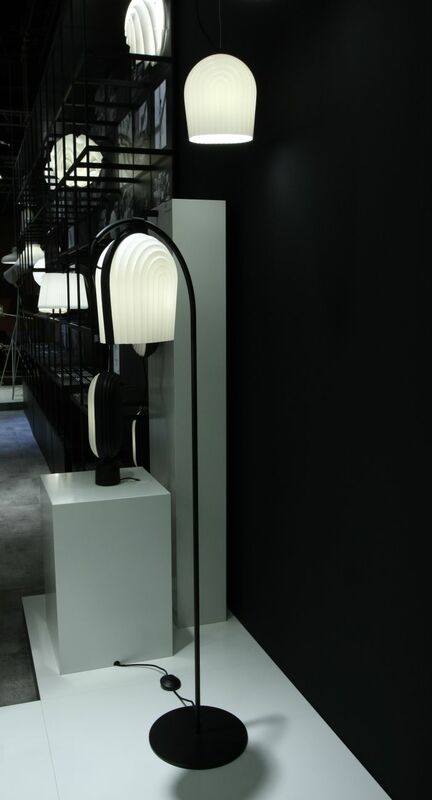 In particular the Wall and Table lamps which see the arches extended into rings, and which has the tendency to amplify the stylistic impression; less so the pendant and floor varieties which represent the arches, more or less, as they are, and, and arguably most importantly, removed from their context. Freed from being supportive features of such a inconceivable construction and being made the object in their own right, yet still objects suspended in space, a space to which they have the same intimate relationship, the pendant and floor versions acquire an independence which they thoroughly enjoy, and which enables them to exist independent of the ideals that formed them. And which is most satisfying. And yes, is still a little Art Deco. But as with the table and wall lamps, it’s not the sort that makes you hide behind the sofa or consider leaving the country and changing your name. Rather all four lamps represent a confirmation that architecture and design are continually revolving and evolving helices and that contemporary is but a synonym of historic.